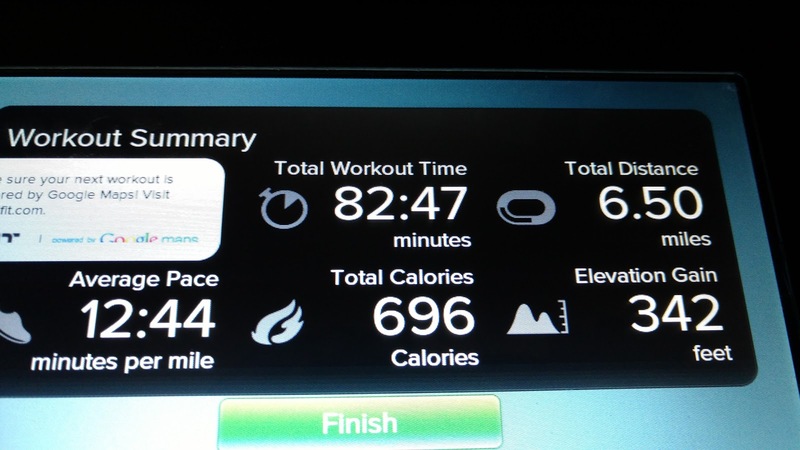 I barely ran last week, so I rather cringe to say it's half marathon training, but still, I am in training! One great thing that happened last week was that my husband hung up a medal holder for me. It's in front of my treadmill. I'll be starting marathon training after this half marathon cycle and I daresay I'll be spending a lot of time on the treadmill this winter. I'm not going to do my usually daily recap for each of my runs. I ran 3 times. 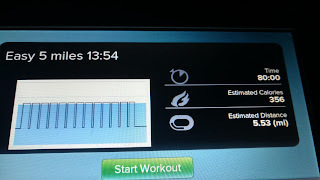 All on the treadmill, all an easy run/walk pace around 14:00/mi. I was taking it easy for a couple of reasons. 1) I wanted to be sure I hadn't injured myself when a bruise popped up on my right outer thigh just above my knee. 2) I was going out of town to ride an endurance ride and was resting up for that. The endurance ride didn't happen. We drove out there and were there, but the ride itself never happened. I'll post on my endurance blog about that in the next few days after I have time to process it myself. Fortunately, I never had a single issue from the bruise. I don't know why it popped up, but it's gone and I'm going back to training. 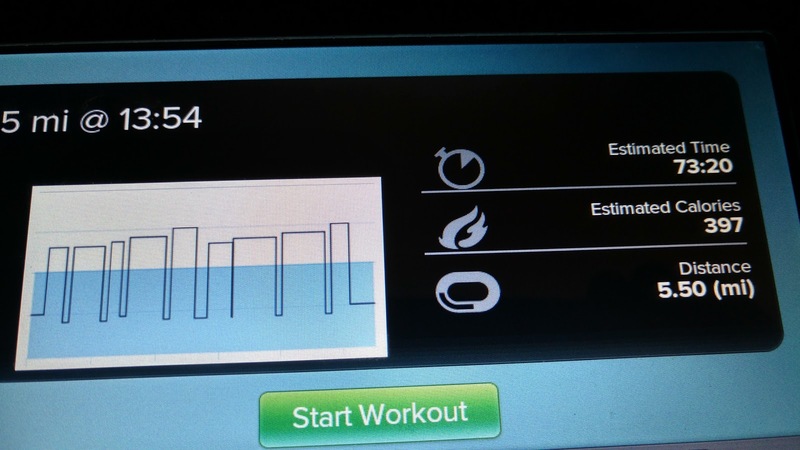 This week, I've already missed Monday's run, but I'll continue on with training the rest of the week. The Iron Horse Half Marathon is just 2 1/2 weeks away. I paid to have my run packet mailed to me, so I already have that. Saves me from having to do the out of town packet pick up thing the morning of. Well, this was my first fail kinda week of this training cycle. I've been very consistent with my workouts, hitting most of them, adjusting as needed. But I made a mistake on my first run that resulted in some missed runs. That 12:00 average pace is the problem. 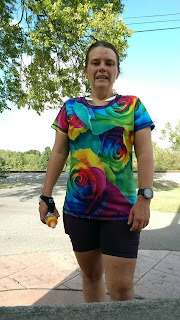 I was very busy getting back from vacation and I didn't have time to go to a park to do my steady pace run. 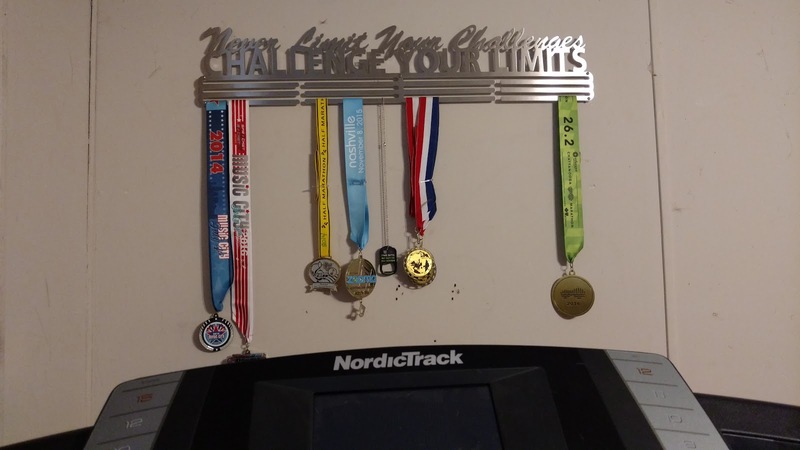 I've tried hard to keep the treadmill runs this cycle to my easy runs and do my substance runs (hill, steady pace, long runs) outside, but I couldn't justify the extra 90 minutes to drive somewhere. I should have. Or rather, I should have kept to my normal pace. My steady pace runs are supposed to be at 12:36/mi. But I programmed the treadmill to 12:00 with a 1% incline. My legs were very heavy for the first 2-3 miles, but I lowered my head and stuck with it, my legs lightening up half-way through. 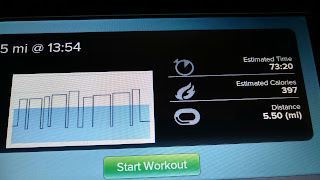 My average heart rate was very good. After the run, I had some mild shin pain in my right leg, but that resolved after a couple hours and I figured everything was fine. Back to easy miles for this run. I did my normal run/walk on the treadmill. Again no time to go out to run. Absolutely no problems on this run. Just my nagging thought that I should bump my paces a little after the half because it felt way too easy. Apparently my camera caught me in a deep breath after my run. 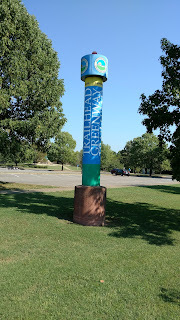 For my long run, I took the time to drive out to Stones River Greenway in Murfreesboro. I really enjoy that trail system. 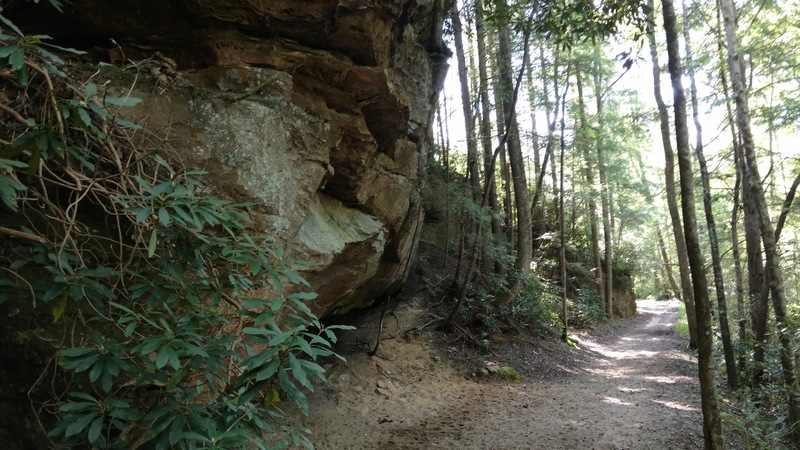 This time, I parked at the General Bragg trail head and ran through parts of Stones River National Battlefield. They have a very good water bottle filler at their restrooms. That part of my run was partially on trail. Fun when it's dry, but would be slippery when wet and not suitable for my street shoes, but it was dry so no worries. After running through the battlefield, I returned to my truck and passed it by, running down to Old Fort Park to get the rest of my miles in. I managed to hit my long run average pace spot on! I was thrilled. Only a couple of miles at about 13:50 and a couple at 13:06, but the rest very very close to target pace. Mind-wise, this was NOT a very fun run, honestly. After I got done with the battlefield, the other 5 miles were a bit of a slog through, but hitting my paces certainly made me happier. I was not scheduled for rest days for the rest of the week. However, Thursday morning, I noticed a large black/purple bruise on the outside of my right leg, just above my knee. Other than poking at it, there was no pain, but there was a small knot in the middle of the bruise. I had felt no pain on any of my runs this week. I can be a bit clumsy didn't remember banging anything hard enough to get a large bruise. To be on the safe side, I ditched my Thursday easy run and my Friday hill run. Bruising means bleeding somewhere and I don't want to push through something and end up derailing my overall goals. My best guess is I did something Monday that caused a bit of bleeding. I ran too fast, for too long, without building up to that speed. 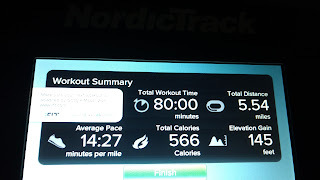 And since it was on the treadmill, I didn't get the benefit of different stride lengths and slightly faster and slower speeds. I thought I'd be ok, but I'll have to be more careful. Maybe the bruise had nothing to do with that workout and maybe it did. But I'm going to take it as a lesson. I'm off on vacation again the later part of this week. I was scheduled for 2 easy runs, a steady pace run and a long run, but I'm just going to do 2-4 easy runs at 2-5 miles each. Then I'll see how things are. Due to vacation, I likely won't get my next blog post up until the middle of next week. 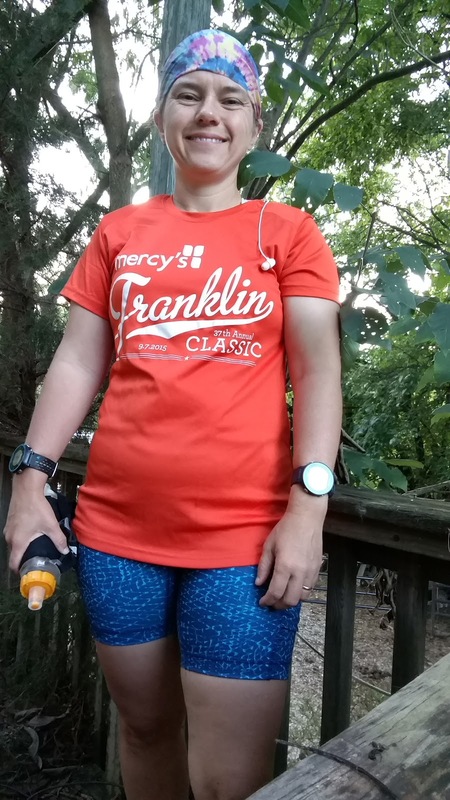 This Monday run was Labor Day, so I went to do the Franklin Classic. This is the 3rd or 4th year I've done this race and I really enjoy it. Since the 5k starts 90 minutes after the 10k, I get to run both races. 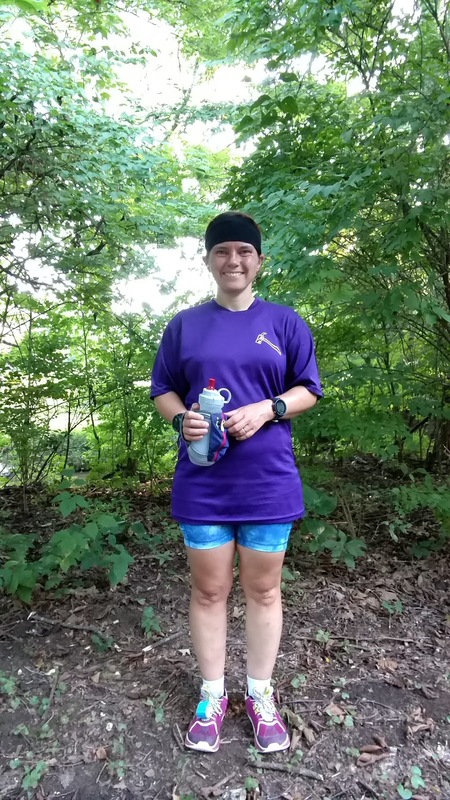 I waffled a lot on my strategy for this race, since it was a race, but also "just another long run" as part of my half marathon training. I finally settled for "run as much as possible" while giving myself the option to walk if needed. I ended up running both races except for walking through the water stations. There were 6 (!) 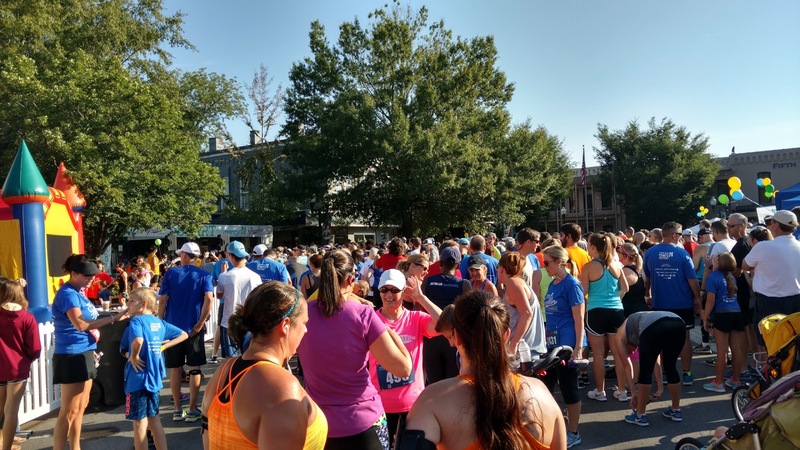 stations on the 10k and 3 (!) on the 5k, so I got a walking break about every mile. I managed a 11:57/mi pace on the 10k and a 12:19/mi pace on the 5k. Neither one of those was good enough for a PR at those distances, but they were both PRs for that course. 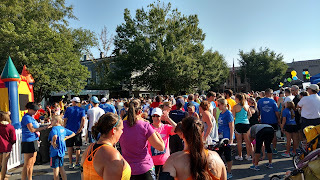 During the 10k, I spent almost the entire run chanting "slower, slower" to myself and I think that enabled me to still run well in the 5k, although admittedly, I wish the 5k had been a little faster. Still very solid performances and I'm happy with both races. 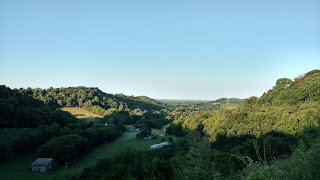 My hill training on Fridays seems to be yielding results as I was able to run even on the hills and the "hills" weren't nearly as scary as they were last year. There are some cool rocks out there. We went to Big South Fork to help out at an endurance ride on Tuesday and were there for the rest of the week. 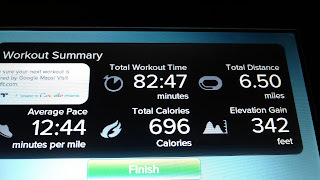 Wednesday afternoon, late, I managed to squeeze in a 3.5 mile run, even though I was scheduled for a 5 mile run. It was a trail run and some parts were sandy, so it was tougher than my usual recovery runs, but I managed to keep to my recovery pace. It was about 90°, but the humidity wasn't too bad. 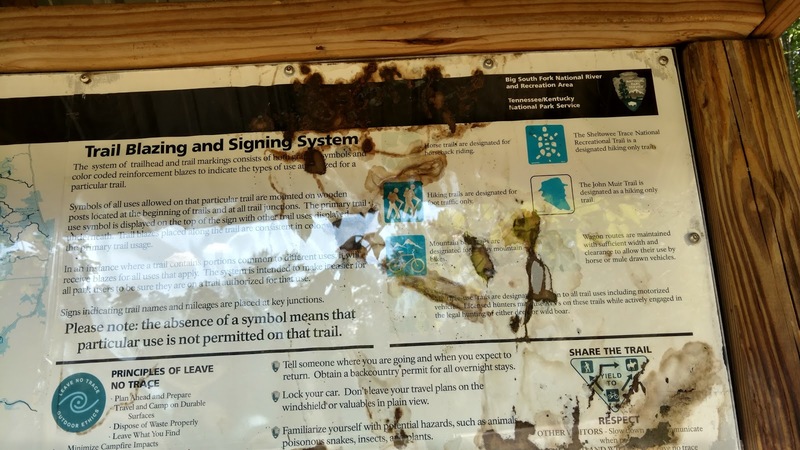 Sign at a trail head explaining the trail marking system. Thursday afternoon, I found I was done with my endurance ride volunteer duties for the day, so I went for a trail run to get GPS tracks for my husband so he could put more trails on Google Maps. I originally planned a 5 mile run, but the route he wanted would take me about 8. I was ok with that. Some of the trail was really rocky and steep, so it was sort of a hiking run. I ran where I could and hiked when I couldn't. I missed one of the trails that Daniel wanted me to get, so I ended up running 10 miles instead of 8. 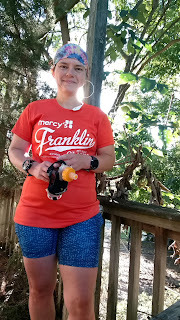 I got a message to him through my inReach satellite communicator to come pick me up at another trail head so I didn't have to run back to camp and add another 3 miles to my run. I used a single water bottle and refilled it from the creeks with my Sawyer Mini water filter. It was a lot nicer to carry the water filter than multiple bottles of water. On one of the trails, I came very close to a black bear who was about 20 feet off the trail. I was running along watching my feet; you know how you do when you're trying not to trip and face plant. I glanced up and off to the side and there he was! I was so shocked to be so close to him. I saw him first (I guess I run with a light step??). Thoughts of what to do if he decided to come my way flitted through my mind when he glanced over his shoulder and freaked out when he saw me. He ran away very fast. No pictures, but that's the closest I've ever been to a bear! I was supposed to run again on Friday, but there was an endurance race going on, so I volunteered all day and never got the chance. I suppose I could have snuck away for a run, but I didn't and I didn't really feel the need since I got as many miles as I had originally planned anyway. 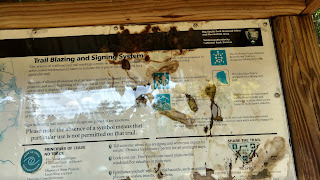 I spent a lot of time on horseback marking trail. 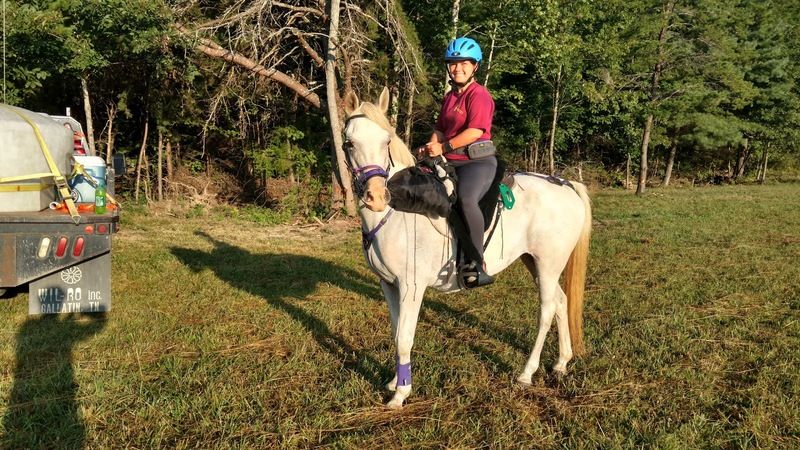 This is my 13 year old endurance mare, Sasha.